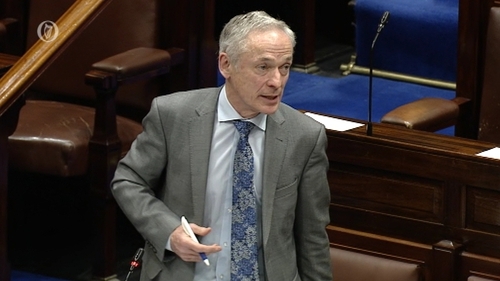 Minister Richard Bruton said this morning that Cabinet would need time and space to discuss the plan and this not possible tomorrow. "There is a determination to reach a decision in a timely way, but it is an important decision and it's one we are determined to get right," he said. The plan that was first promised in 2011 will seek to deliver broadband to more than 500,000 homes across the country. Fianna Fáil has strongly criticised the delay in bringing the plan to Government. The party's communications spokesperson Timmy Dooley said this is shocking given the Taoiseach's promise to have a decision made before Easter. He said the preparatory work on the plan should have been completed long before now. Darragh Shaw runs a plant nursery in Turlough outside Castlebar in Mayo. The village is home to the National Museum of Country Life but he says businesses, schools and homes are seriously struggling without proper broadband. Mr Shaw says it can take hours to upload emails and photographs which are essential to the smooth running of his business. He describes Turlough as a broadband blackspot due to high speed cabling not extending as far as the village. The Turlough Community Development Association met with Mr Bruton last month to highlight the broadband and mobile reception issues in the area. The minister undertook to prioritise the issue of poor connectivity in Turlough. Mr Shaw says the community is deeply disappointed that no decision will be taken by the government on the rollout of the national broadband plan before Easter.